Wyoming is a state in the west part of the US. It's nicknames are the Equality State, Cowboy State, Big Wyoming and Wonderful Wyoming. It has the fewest people of any state in the US. 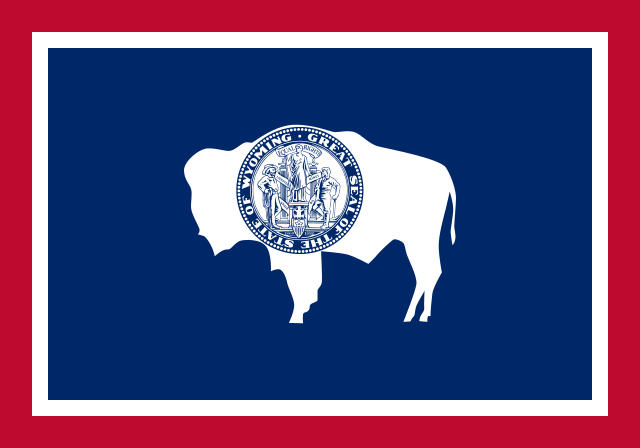 The flag of Wyoming has a red and white border with a blue background and a white picture of an American Bison. The red is for the Native Americans and Pioneers, the white is for purity and goodness, the blue is for the skies and mountains. The bison is for the nature found in Wyoming. 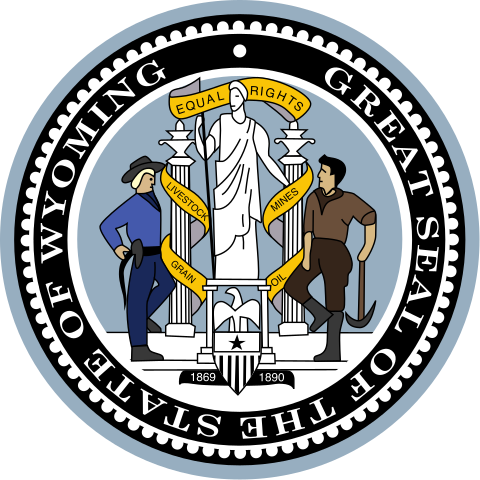 The seal of Wyoming shows a farmer and a miner, the lamp of knowledge, the words Oil, Mines, Livestock and Grain, and a statue in the center that says Equal Rights, which is for the equality of women in the state. Yellowstone National Park is in Wyoming. It is one of the largest and oldest national parks in the US. It is a home to many animal species like moose, wolves and bears that can't live in big cities so they live naturally at Yellowstone. It has many natural wonders, like it's own grand canyon. Grand Prismatic Spring is at Yellowstone, it is the largest hot springs in the US. The geyser Old Faithful is at Yellowstone, which erupts every 91 minutes.